To anyone hopeful that a trove of negatives and prints photographed between 1949 and 1980 by the long-defunct Ninomiya Studio, formerly located at 353 E. First St. in Little Tokyo, could be professionally preserved and made accessible to the public after narrowly escaping being tossed away, that wish has been granted. 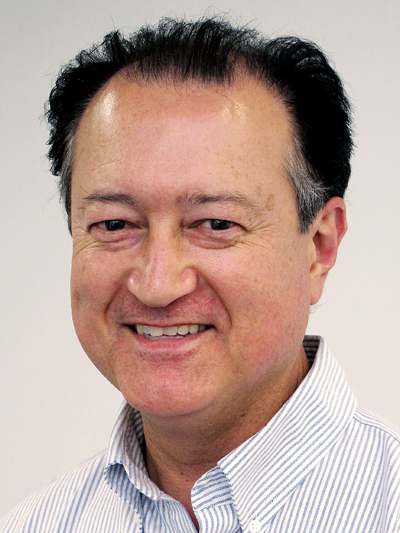 According to Gregory Williams of California State University, Dominguez Hills, in Carson, the Library Archives and Special Collections was just chosen to receive a $100,000 grant from the California Civil Liberties Public Education Program. Mary Beth Barber, program coordinator, special projects, at the California State Library, which administers the CCLPEP, said this latest grant cycle was the first one in seven years. There was about $1 million available, she said, and it’s completely up to the governor and State Legislature to decide sometime around the end of June whether there will be another CCLPEP funding cycle in the next state budget. The Ninomiya Collection is being catalogued at the CSUDH Library. An outside contractor will need to be chosen to digitize the more than 100,000 negatives and prints the university obtained in mid-2016. He noted that no vendor has yet been chosen because they are so early in the process, but they do have a year to complete the process. In 2010, Bob Tanabe, owner of TLC Renovation in Tujunga, said he had been hired by Clara Tokiko Ninomiya, the widow of Elwin Ichiro Ninomiya, who died in 2009. He owned and operated the business started by his father, Kinso Ninomiya. Tanabe was tasked with renovating a four-unit apartment building the family owned in East Los Angeles. “She just needed to clean it out and didn’t know what to do, so she said just haul it away, get rid of it, because she needed to clear up the space there,” Tanabe said. He felt, however, that the collection had some sort of historical value and was reluctant to just let it end up in a landfill. 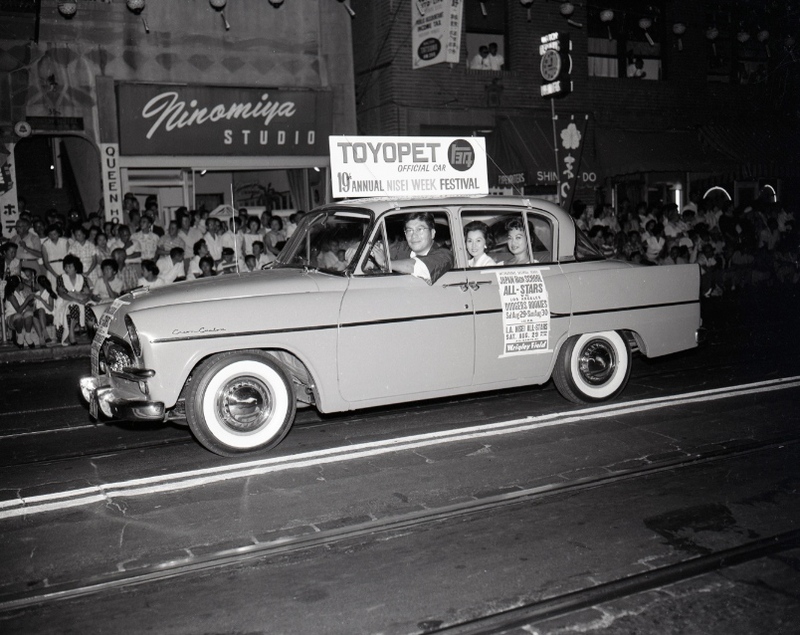 A photo of the Nisei Week Parade in the 1950s with Ninomiya Studio in the background. Although Tanabe said he made an inquiry with the Japanese American National Museum, he was told they didn’t have space for it. So, he put an ad on the want ads website Craigslist.org, and one of the persons who responded was a Glendale-based photographer and Directors Guild of America member named Michael Risner. Asked how CSUDH ended up getting what Risner had collected, Williams said the key came down to patience. After reading about Risner’s collection back in 2010, Williams contacted him and invited Risner to visit the CSUDH campus. He brought some samples from the Ninomiya Collection. The next year, Williams asked Risner if he wanted to contribute some of the photos to a small exhibition the library was having to mark the 40 years CSUDH had been collecting Japanese American material. He said Risner sent some scans he had made, which were printed and used in the exhibit. “Essentially, I was trying to build up some trust and an understanding what the collections could do,” Williams said. To get an idea of the number of images in the collection, Williams said there could be 15,000 packets containing maybe 100,000 negatives. Williams realized it was simply too much for an individual to deal with, something that Risner himself must have realized, even though he himself wanted to make sure the collection was taken care of properly. Williams, meantime, said he kept in contact with Risner over the intervening years, checking in with an annual email to inquire about how he was coming along with it. “Finally, last summer my pestering paid off. He said he was ready to donate the material,” Williams said. With that, Williams rented a U-Haul van, went to Risner’s residence in Glendale, and filled the van with boxes from the Ninomiya Studio. 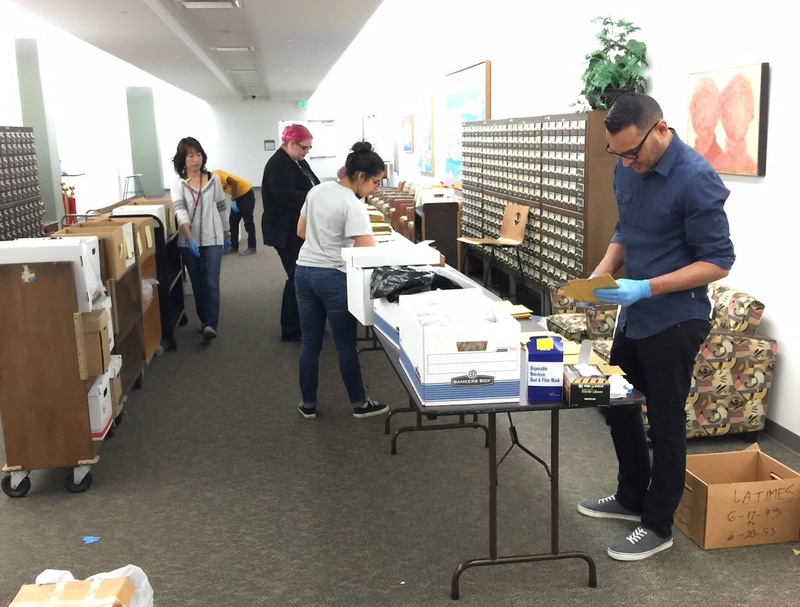 Once delivered to CSUDH, Williams said, the first step was to not only physically rehouse the Ninomiya Collection, but also physically reorganize it and catalog into a database. Williams noted that there were breaks in the years, which he speculated may have been those bags that Tanabe gave to others besides Risner who answered the Craigslist ad. Most of the years represented are in the 1950s and 1960s. Thus far, the images CSUDH library has processed have been scanned at 600 lines per inch. Now, with the CCLPEP grant, this time-consuming and labor-intensive process can be farmed out and the library staff can work on joining the metadata with the images. Once that happens, the Ninomiya Photography Studio Collection Access Project will go online for use by historians, scholars, writers and the families who images were preserved by Ninomiya Studio. (Williams said he has already been called by a woman in Northern California looking for a family photo.) That’s cause for celebration, and I hope that when that happens, Bob Tanabe and Michael Risner can be feted for saving that collection. As for Risner, I tried to contact him for this column, but was unsuccessful. I’m speculating here since we didn’t talk, but I get the impression he’s been having some tough times on the employment front of late; maybe other issues, too. But if not for Risner recognizing the importance of what he found in 2010, those invaluable images from the Ninomiya Studio could be buried in a landfill or destroyed for the silver content in the negatives. Maybe someone else can make that documentary. Or, maybe those images can be the foundation for a coffee table book on a special slice of Los Angeles history — heck, make that American history. At the very least, those images have been saved — and that’s important. You might note that the LA Weekly was the first LA press to write about this.